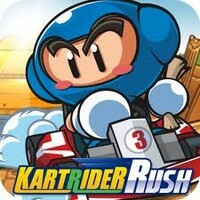 KartRider Rush is a cute little free app on the iPhone/iPod Touch. I am not clear where we heard about this app first. I do know it sat patiently on my iPod Touch until I had time to work on it. Boy am I glad I did get to it too. Like many free apps there are free levels and pay levels. The free levels give the player a good example of what the game is like. If you like it then you can pay real world money to purchase more levels. The cute characters in KartRider Rush remind me of the Bomberman. There are a couple of different modes. One of them is Item Mode. This is where players can use Mario Kart style items while racing. The other major mode in KartRider Rush is Speed Mode. This is without the items. There is also Multiplayer, Garage, and the Store. The violence in the Items Mode is pretty light. The game stops us from progressing. The music in KartRider Rush is cute. I enjoyed listening to it while playing this hand held video game. I have to admit something at this point. I did not think a decent kart game could appear on this platform. But KartRider Rush proves that thought incorrect. The music and special effect sounds adds a layer of excitement. I love free apps that are actually worth something. KartRider Rush is one of those free apps that is worth something. I found a lot of replay value to the free portion of this iPhone/iPod Touch game. I never got bored with KartRider Rush. Because it is so much fun I did not mind purchasing additional levels. There are multiple choices for the purchases as well. The game play in KartRider Rush is awesome. We do not need to worry about press the gas pedal. Once KartRider Rush tells us go, we take off and keep going. We have a brake pedal, turn right slightly, turn left slightly, turn right really hard, and turn left really hard. I ran into no control issues while playing this cute little kart racing game. I also had a blast playing KartRider Rush. KartRider Rush teaches us to get to the finish line first. We have a choice of using items to assist us, or we can do it by our own skills. KartRider Rush can also teach us to avoid pitfalls, and to do our best while competing. I hope to see sequels to KartRider Rush in the future.